Successfully Added Hystou FMP03b Barebones Mini PC - i3-7100U CPU, 16GB RAM, 256GB Memory, Windows 10, Wi-Fi, Windows 10 to your Shopping Cart. If you want a min desktop PC that can bring high-end processing power with the low-end cost then look no further than the Hystou FMP03b barebones minicomputer. It comes with a 64Bit version of Windows 10 preinstalled and is ready to go right out of the box. The sleek aluminum body has a grooved top that provides extra surfaces space and allows it to act as a large heatsink. 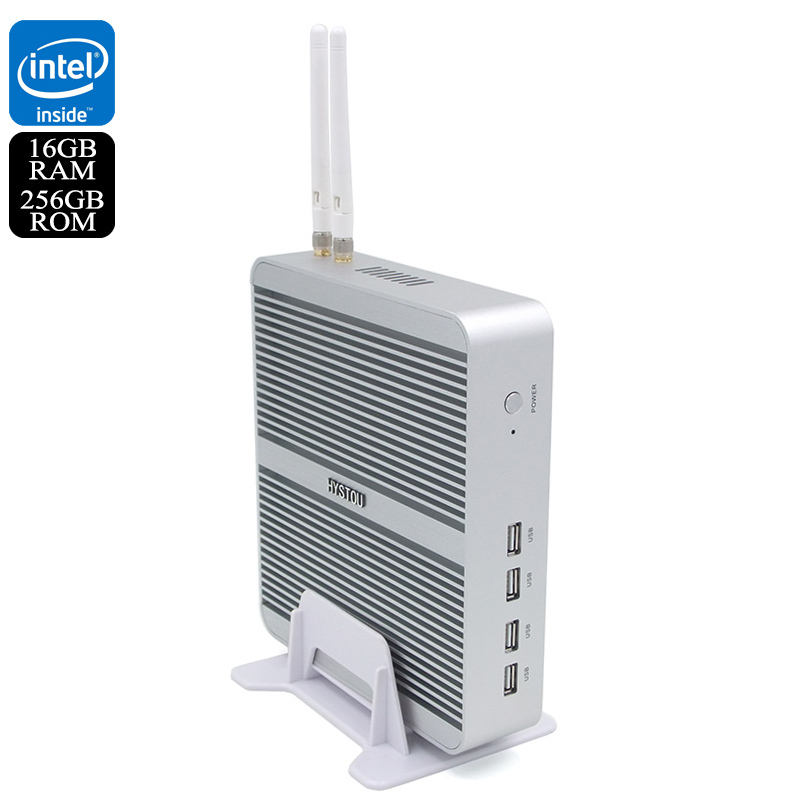 This allows the mini PC to have operated without a fan meaning it runs silently. It has two wi-fi antenna for a better wireless connectivity as well as ports for USB, mic, speaker, VGA, HDMI and LAN cable. The bottom of the mini PC has room for screws allowing you to attached it to the rear of a monitor, alternatively, the desk mount lets it sit virtually reducing the footprint on your working area and also ensuring better airflow for optimum cooling. This mini PC is powered by the beastlike Intel Core i3-7100U CPU and has a whopping 16GB of DDR3 RAM as well as 256GB of internal storage. There is a 2.5inch SATA port for those who require extra data space as well as 4 USB ports for peripherals or pen drives. A Gigabit Ethernet port is able to pull through fast network traffic but with dual Wifi antennas, you can connect wirelessly so there is greater freedom of where you use the mini PC. With its considerable processing potential as well as licensed windows 10 OS you can enjoy high-end computer at bargain prices making this a worth consideration for any home entertainment or workplace computing needs. This Hystou FMP03b Windows mini PC comes with 12 months warranty, brought to you by the leader in electronic devices as well as wholesale min computers and TV boxes..